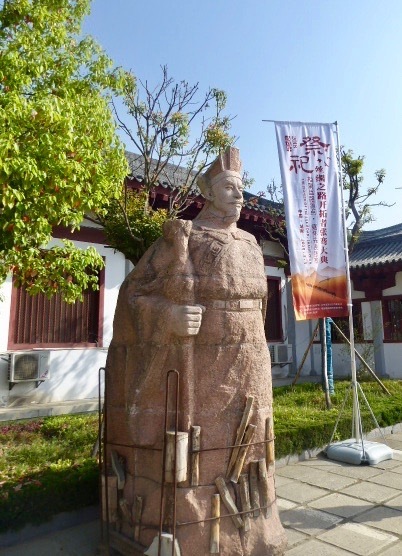 Statue of Zheng Qian, credited with opening the Silk Road which began at Xi'an. Photo Photo © by Judy Wells. 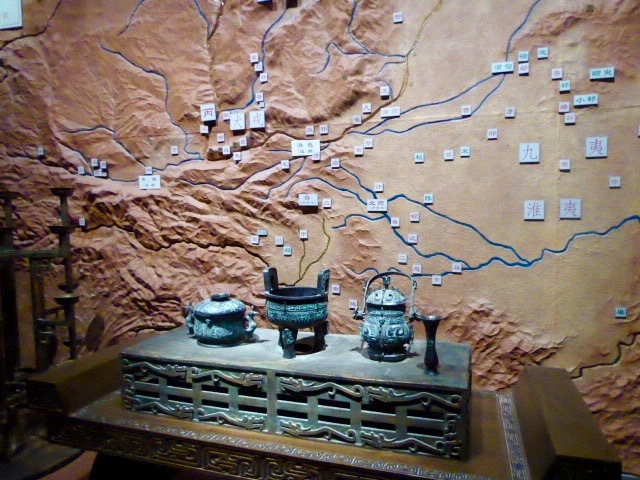 The first dynasty, paper, the Silk Road, the Great Wall, its "alphabet," the width of its roads, its measurements, even the country's name all were born in what is now Shaanxi Province. My name in standardized Chinese letters on paper. 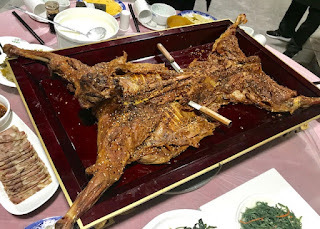 The area bisects the country south to Sechuan Province, north to Outer Mongolia, like going chin to hips on a human torso. 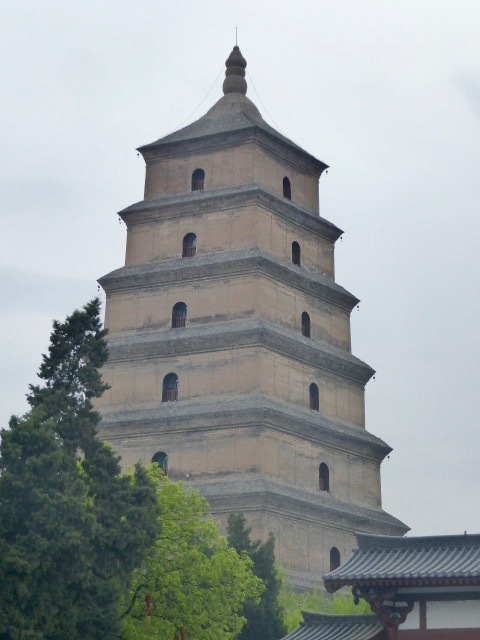 Drum Tower, a familiar Xi'an landmark, Photo © by Judy Wells. 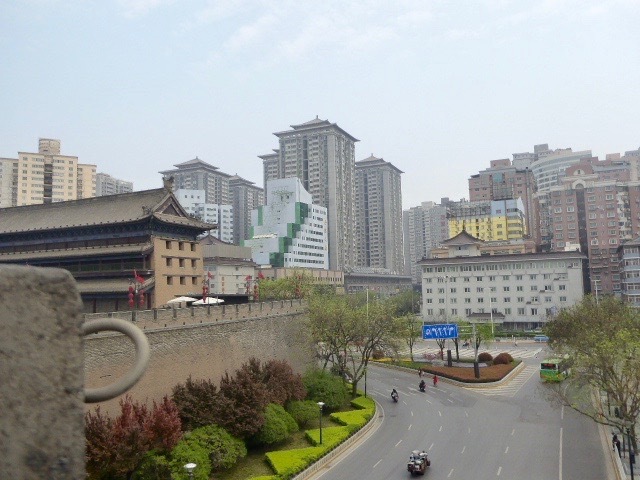 At its midsection is Xi'an, formerly Chang'an and home of the Terracotta Army ordered by that first emperor, Qin Shi Huang *(201-210 B.C. 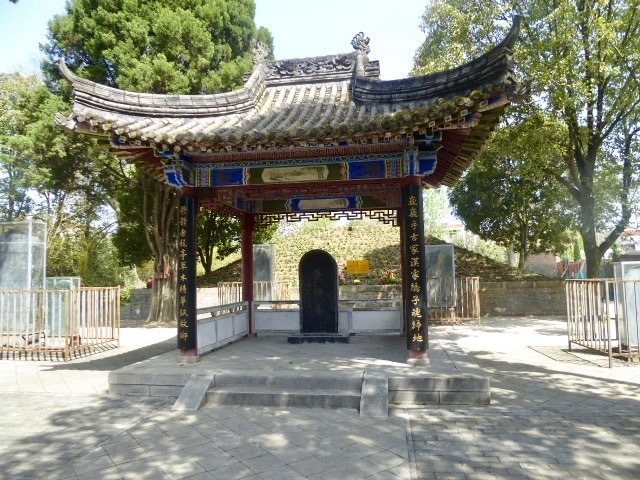 ), for his tomb. 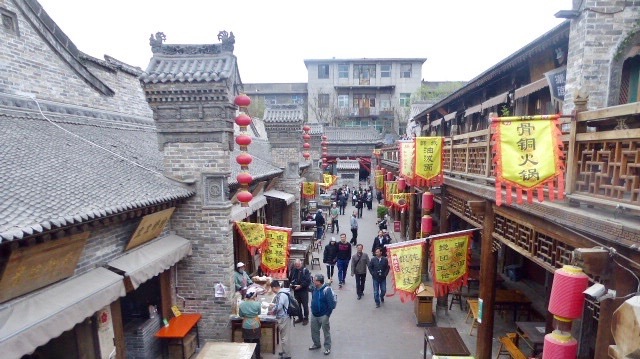 It was the capital of China until the Mongol Yuan Dynasty (1271-1368 A.D.) moved the capital to Beijing. 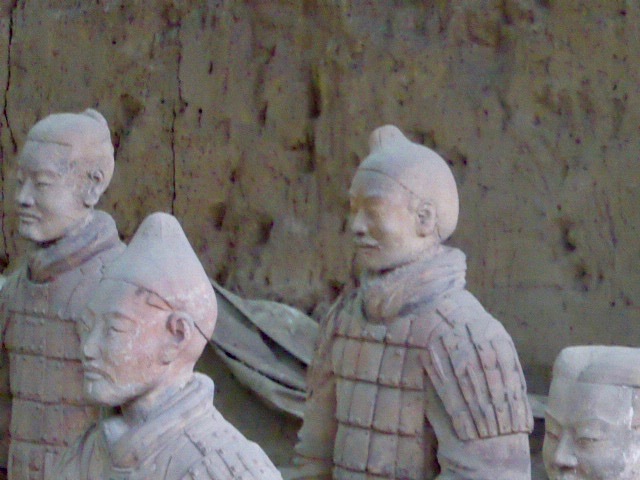 The Terracotta Army alone is worth the trip and sadly, is all most tourists see. 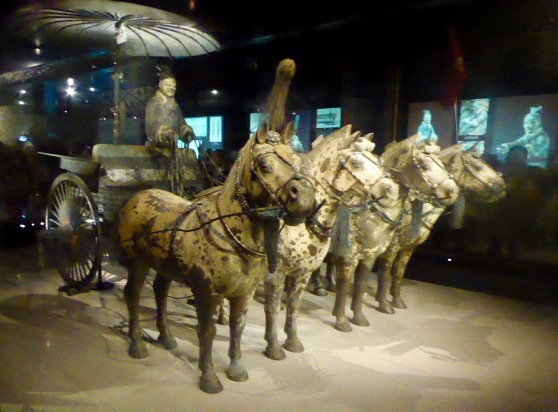 Found in 1974 by villagers digging a well, eventually three separate pits of the warriors, horses, chariots and charioteers and archers have been uncovered. 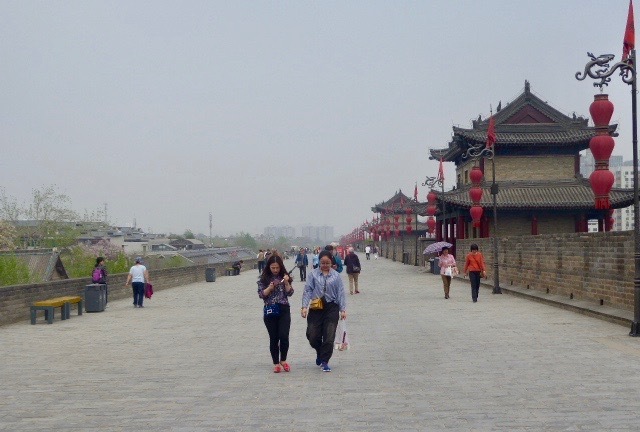 The formally named Emperor Qinshihuang's Mausoleum Site Museum, the complex, about an hour beyond Xi'an, is understandably enormous. With not a single figure intact, the task of reassembling what might be a force of up to 7,000 is daunting. 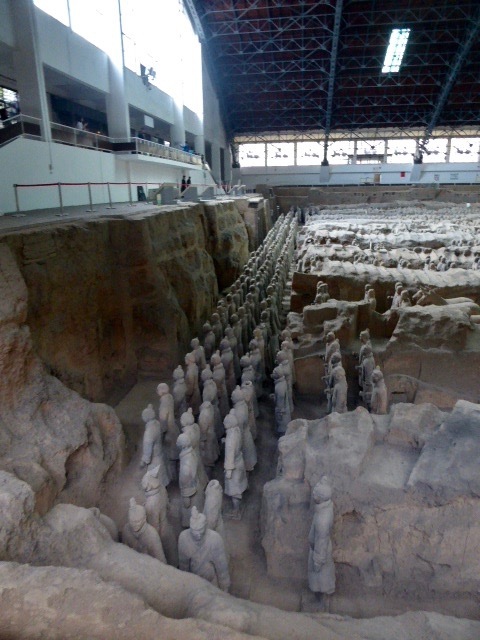 Considering that the emperor's tomb has been located but not yet formally excavated, this will be a must-see for generations to come. 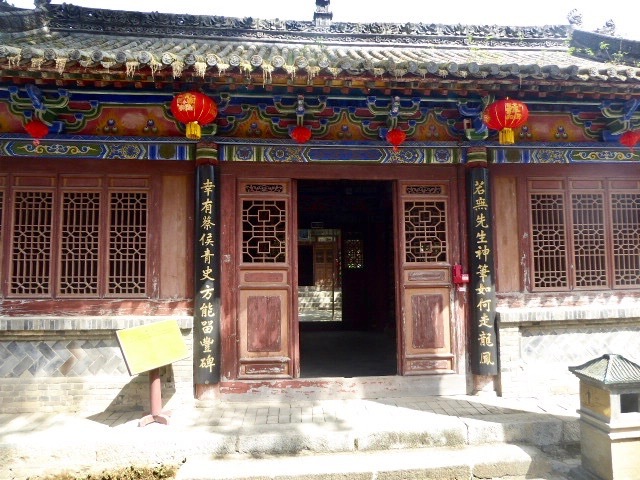 Not far from the warriors is the Lishan hot springs area, the Tang Dynasty's winter palace. The production of "A Song of Endless Sorrow," based on a poem by Tang Dynasty poet Bai Juyi, the Barbara Cartland of his day, is a must-see. 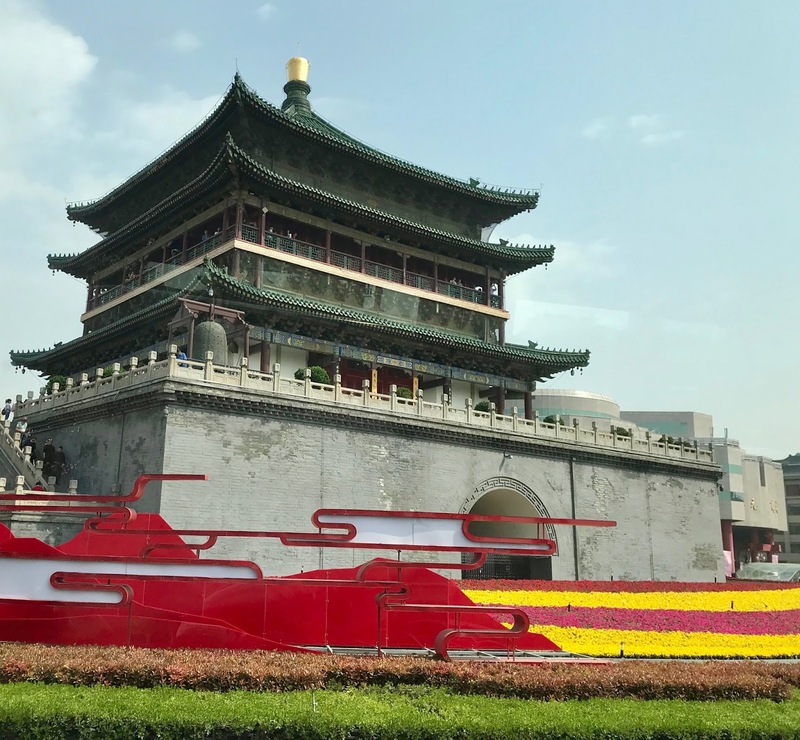 Set amid Huaqing Palace, it romanticizes the true story of an emperor who was so obsessed with a courtesan that he ignored his duties, was attacked and forced to have his consort killed. 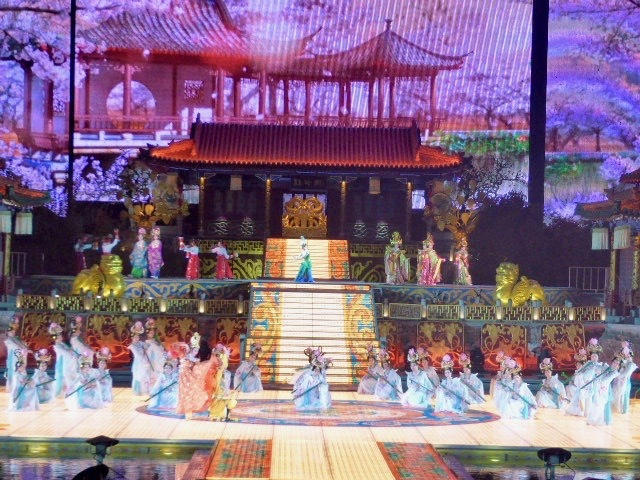 The result is a multi-media spectacular that uses lyrical music, dance, brilliant costumes, water, fire, Mt. 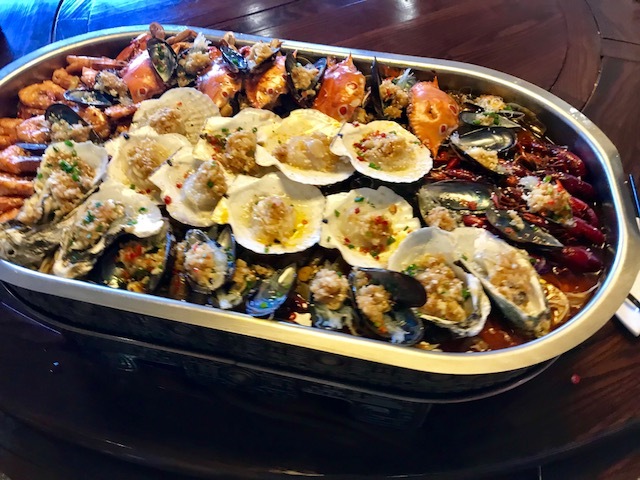 Li and even the stars to create an unforgettable experience. I would recommend at least an overnight stay to take in all this area offers. 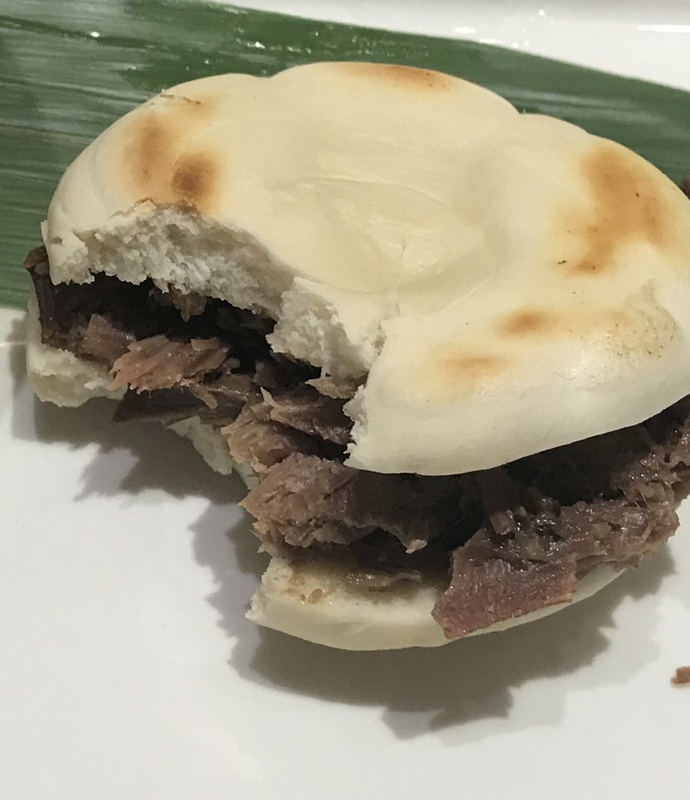 There are many more reasons to prolong your stay in Xi'an and Shaanxi Province. 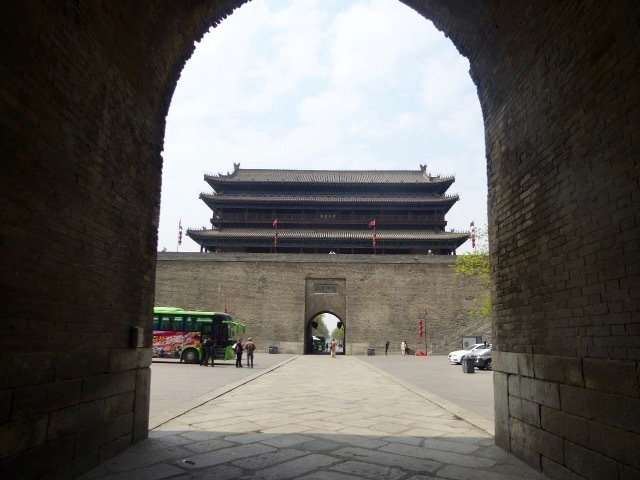 Going through the gate of Xi'an's city walls. Photo © by Judy Wells. 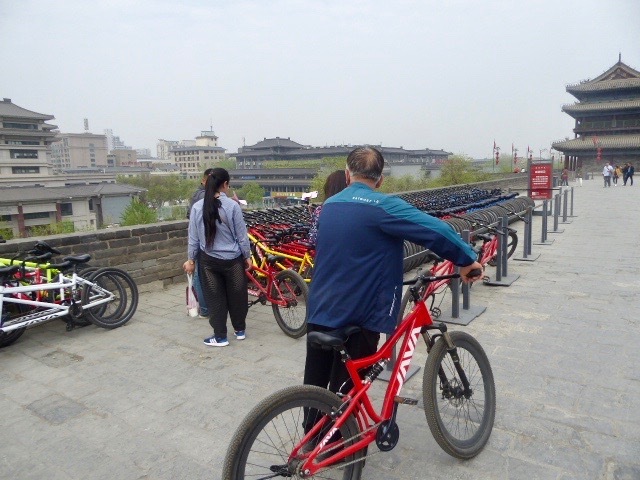 Back in Xi'an, take a walk or bike ride on the city walls. Begun during the Tang Dynasty and rebuilt of brick during the Ming, they now stand 40 feet high, 40-46 feet wide at the top, 50-60 feet wide at the bottom and stretch for 8.5 miles, surrounded by a moat and park. 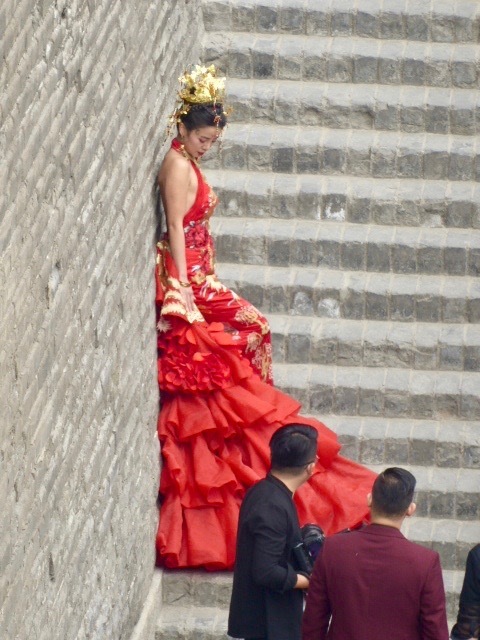 It is a great way to get an overview of the city Also to see brides and grooms posing for photographs attended by an entourage of hair and make-up stylists. 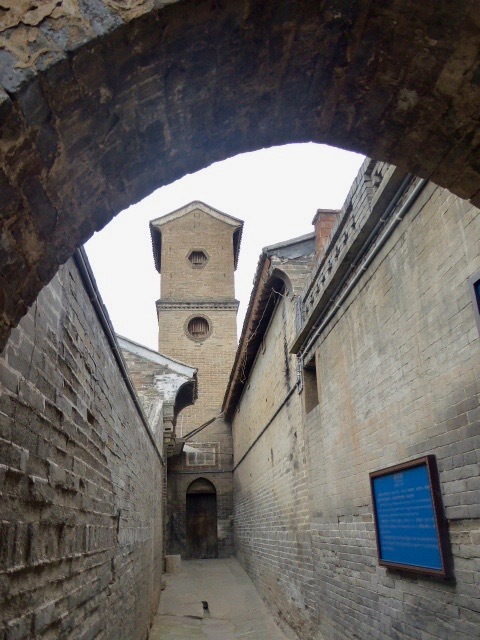 Inside the walls on the site of a former Confucian temple is the Beilin Museum. 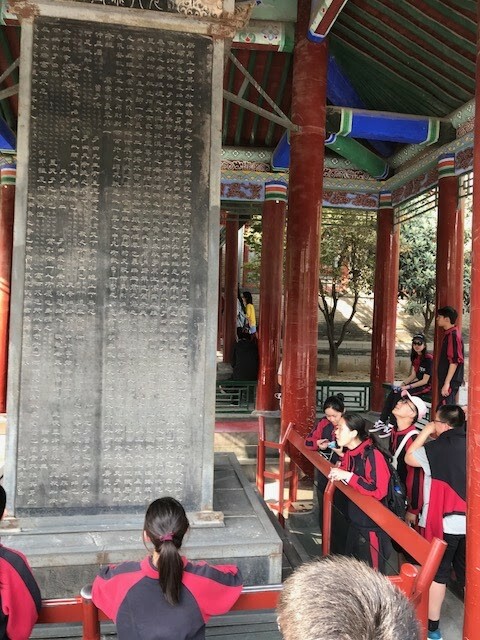 It holds the Xi'an Forest of Stone Tablets established during the Northern Sung Dynasty (1087), displaying nearly 4,000 pieces of calligraphy stelle and epitaphs from the Han dynasty on. 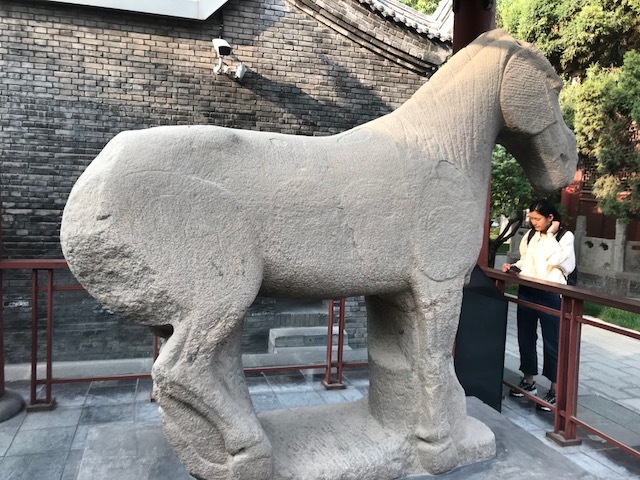 Daxia carved horse, circa 424. Photos © by Judy Wells. Tang and Han Dynasty stone sculptures unearthed from mausoleums throughout Shaanxi Province and religious sculpture are in the art room. 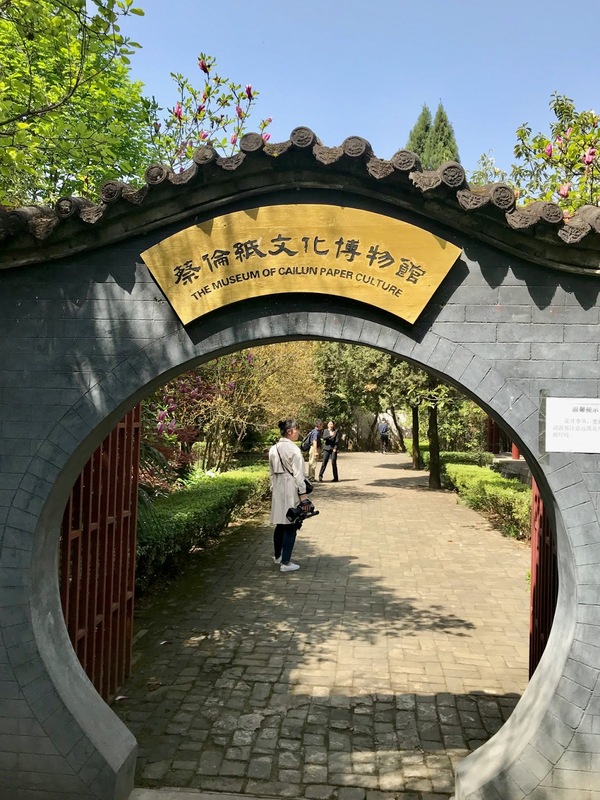 The exhibits may not be your cup of tea but they are evidence of the Chinese respect for language, philosophy, history and culture. 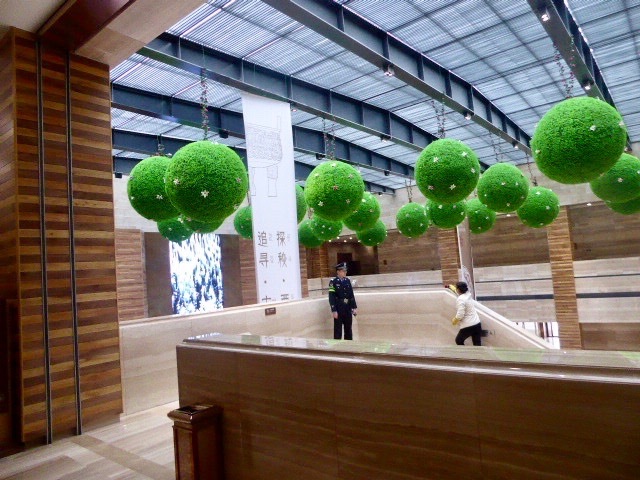 The small complex is beautifully landscaped, a serene spot a wall away from the city of almost 9 million. Give yourself time to take in the bustling Muslim Quarter. 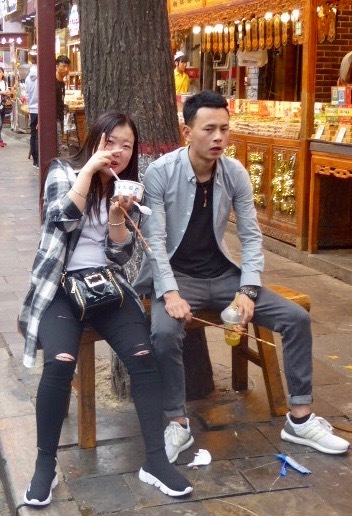 ... and great people-watching. Photos © by Judy Wells. 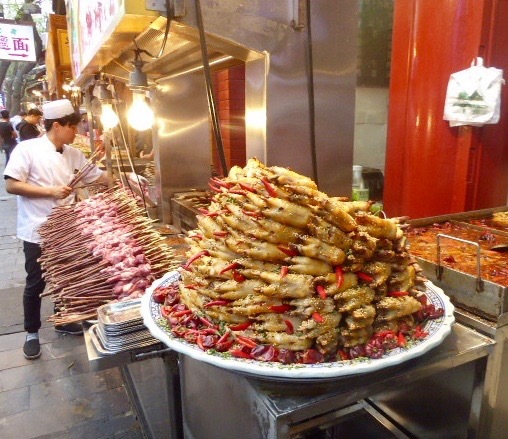 Belyuanmen Street is a treasure trove of street food, calligraphy tools and eye-catching displays. In short, a feast for people watching and photographers. 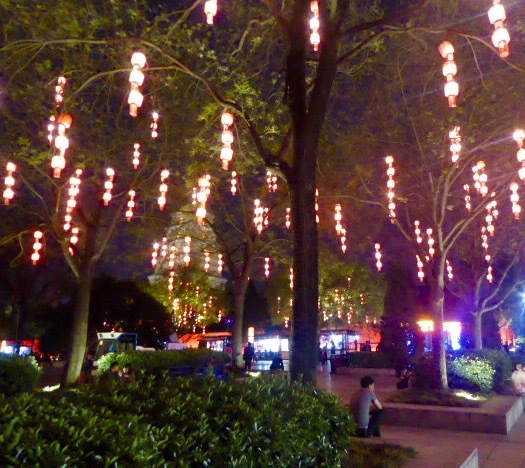 At night the area around the Giant Wild Goose Pagoda is a fairyland of lights, lanterns and a musical fountain show, definitely worth a stroll. ...and by day. Photos © by Judy Wells. 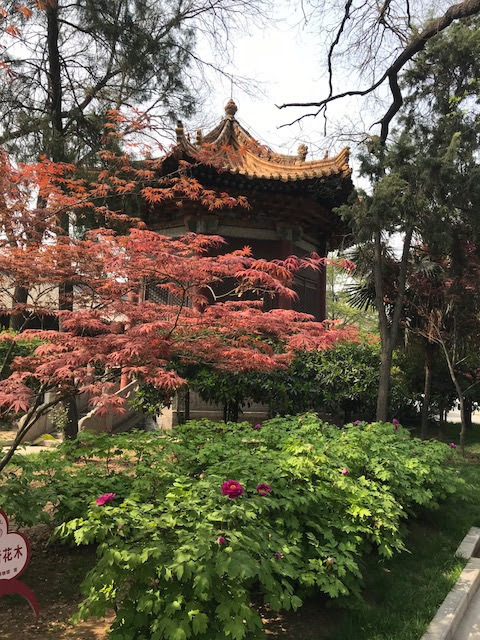 By day, you can climb the Buddhist tower from the Tang Dynasty or merely join the natives in admiring the setting and statuary. 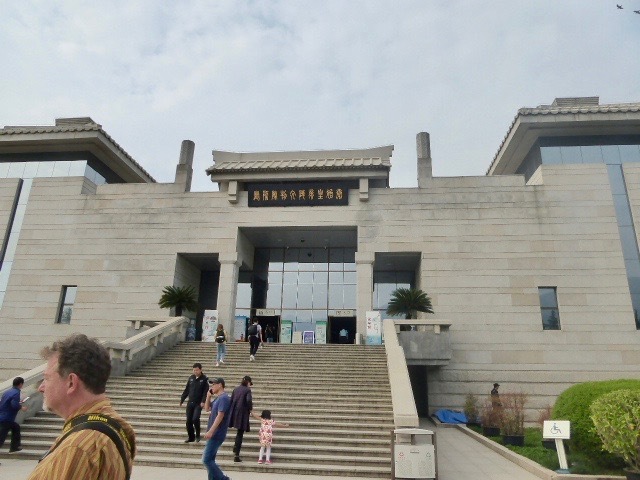 I was unable to see it, but at the top of my list for next time is the Xi'an History Museum with its enviable collection of art. 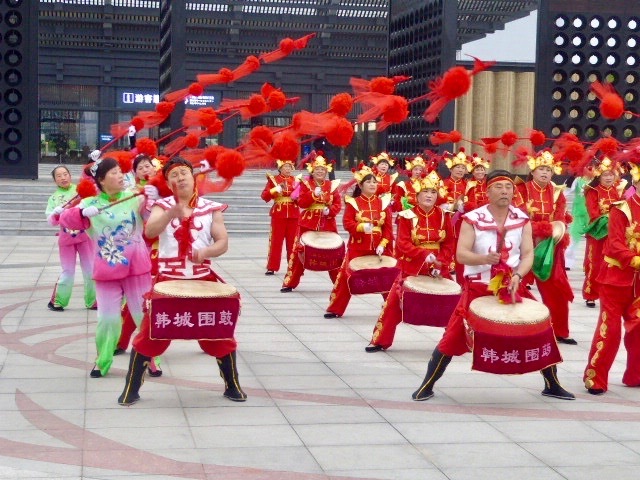 The high-energy Northern Shaanxi Drum Dancers. Photo © by Judy Wells. 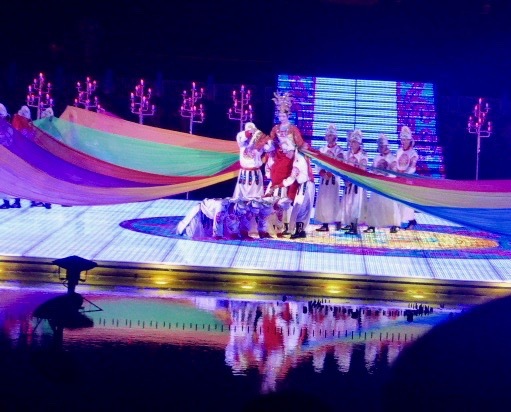 Whatever you do, if there is a performance of the Northern Shaanxi Drum Dancers or any other drum or parade group, go see it! 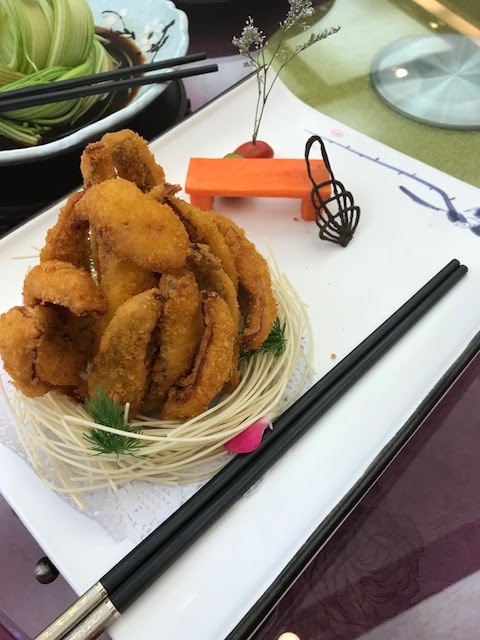 Prep you appetite for artistically presented dishes fit for an emperor. 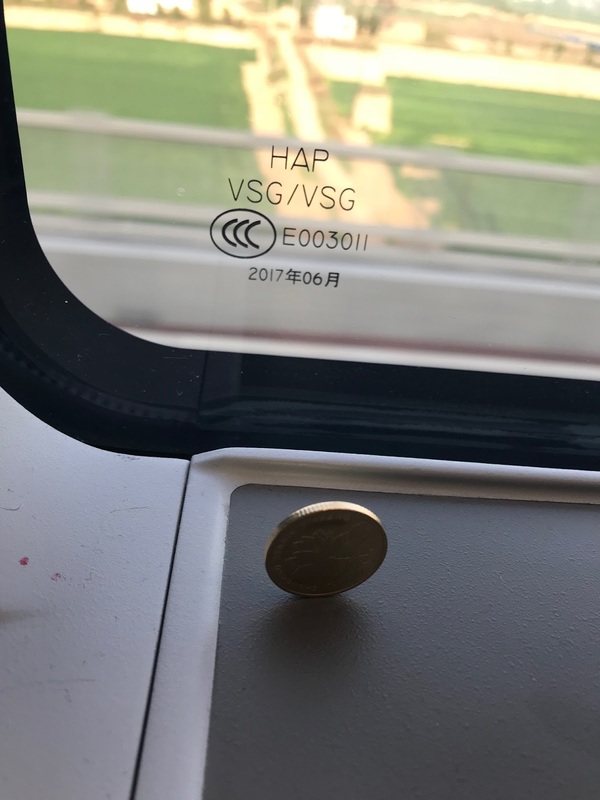 Since 1936, Defachang has been known as the No. 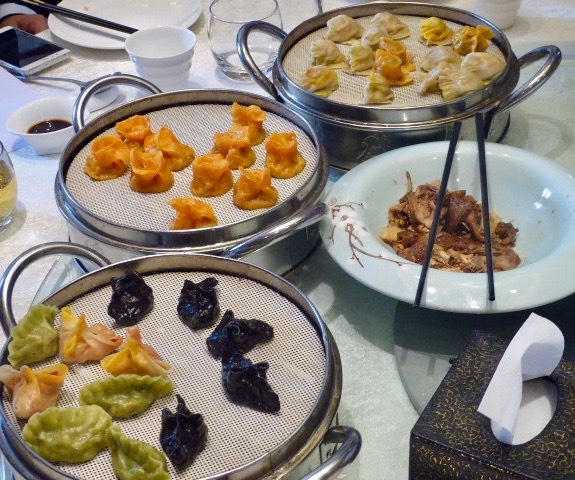 1 dumpling banquet house. More than 200 different kinds of dumplings - boiled, steamed, fried, sauteed, broiled and/or baked in a variety of shapes with a seemingly endless variety of fillings - are available. We were treated beyond stuffed to perhaps 20. Do not miss! 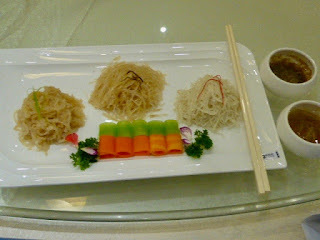 and noodles - rice, wheat, buckwheat, cold, hot and in between, spicy, sweet or savory. 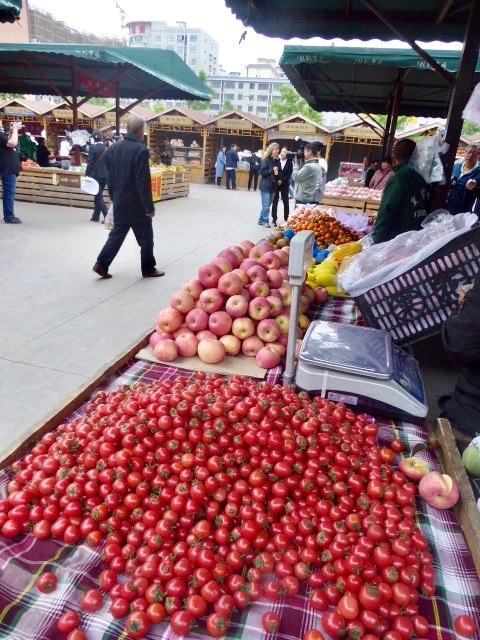 And always, wonderful fresh vegetables, corn on the cob (!) 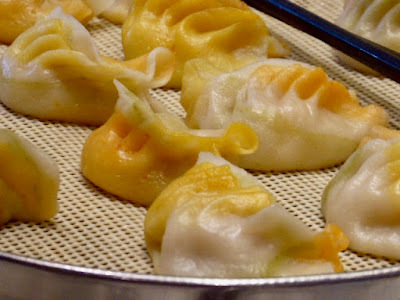 and every possible kind of marinated thinly-sliced vegetable. 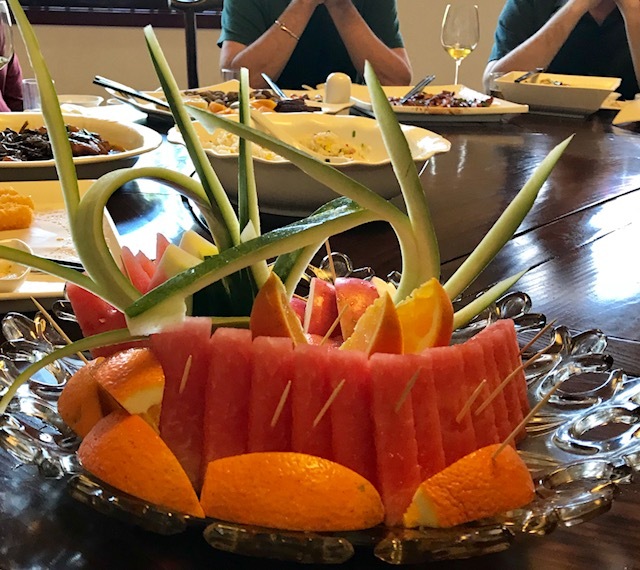 When the fruit platter arrives, the meal is over. 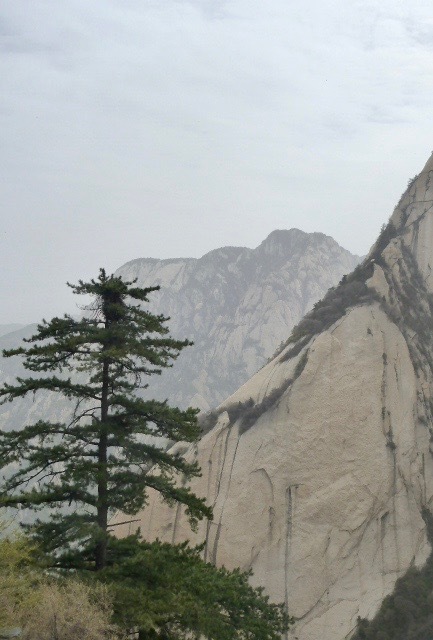 There are many day tours to Mount Hua (Huashan), a target for hikers and climbers (cable cars do some of the work). 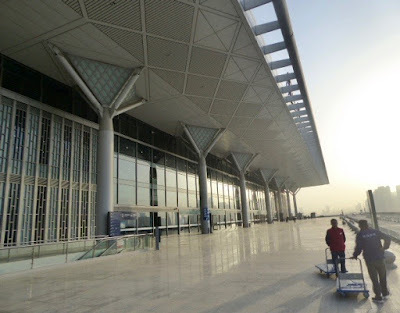 Xi'an's huge train station is a hub for the country's excellent high speed rail system. 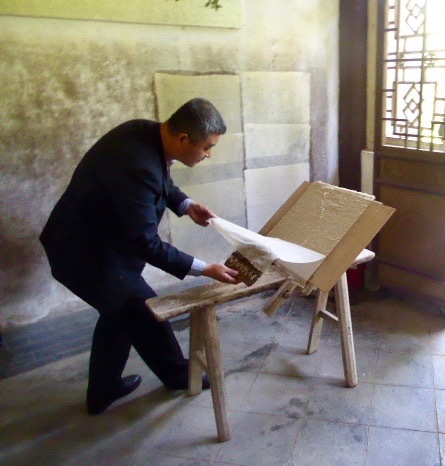 to Cai Lun, inventor of paper as we know it today. 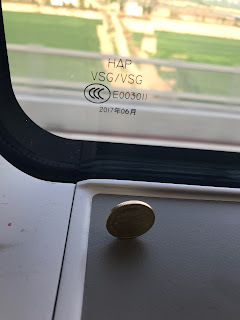 where you can see the process he developed. 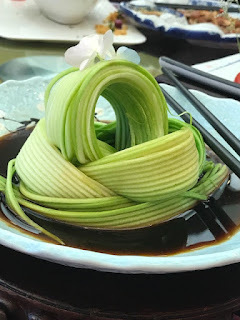 Hancheng is a delightful, tourist-welcoming city with an excellent hotel (Wenyuan Pavilion Hotel) and much to see in the area, including a fun early morning market and near the hotel, what we dubbed "Gourmet Street," a collection of restaurants and street food. "Gourmet Street a\in Hangcheng. Photo © by Judy Wells. 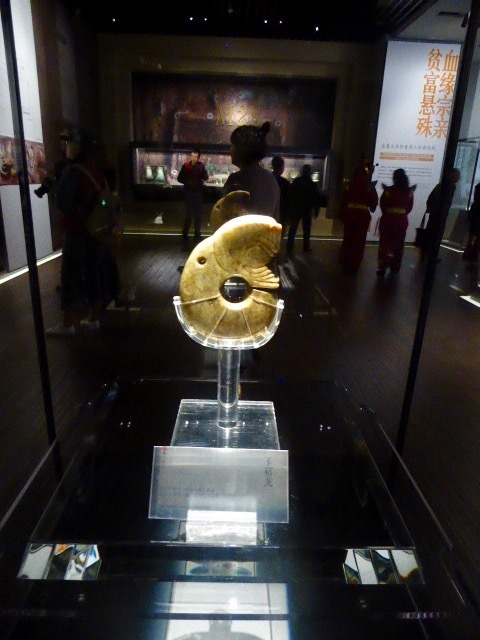 The newly opened Langdai Village Relics of the Rui Museum is a must-see. 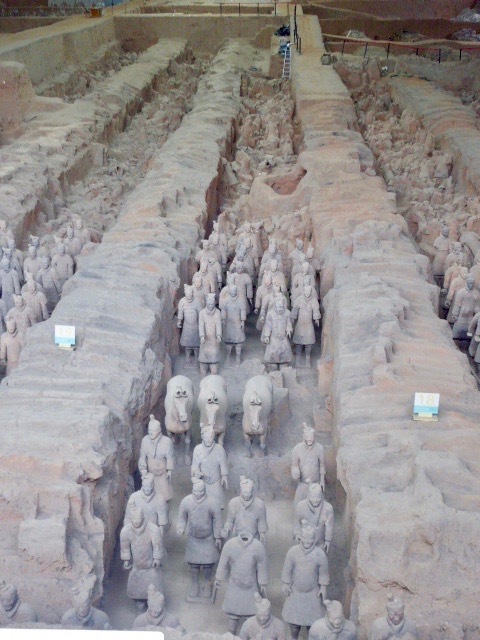 In 2004 1,300 tombs were discovered there including seven large ones. 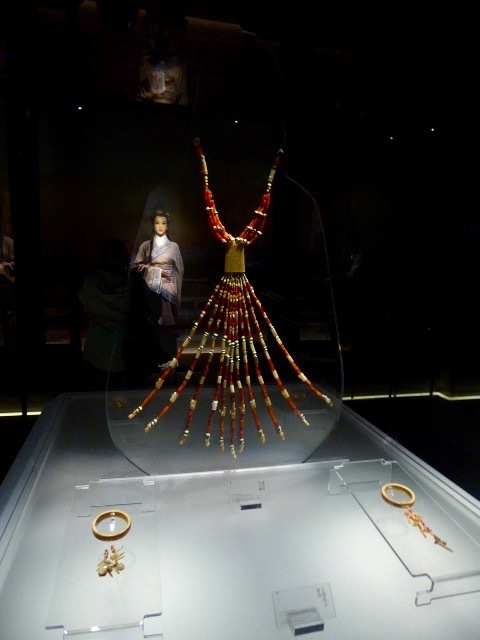 Jewelry for the Empress Zhong Jiang who collected the museum's prize, a 5,000-year-old jade pig dragon. dating from 5,000-3,000 B.C. 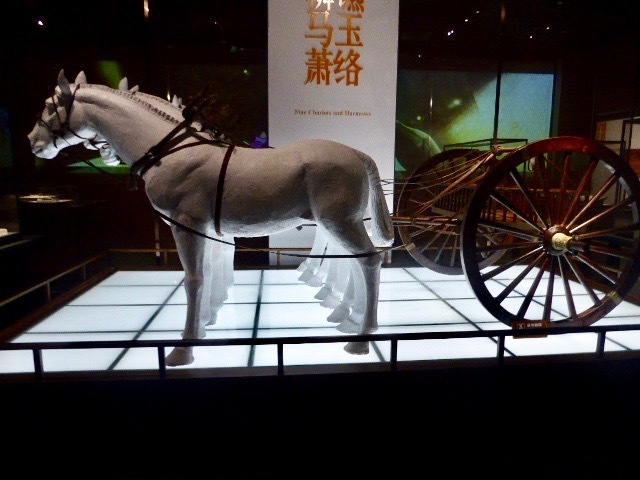 were collected for display in the striking, interactive museum. 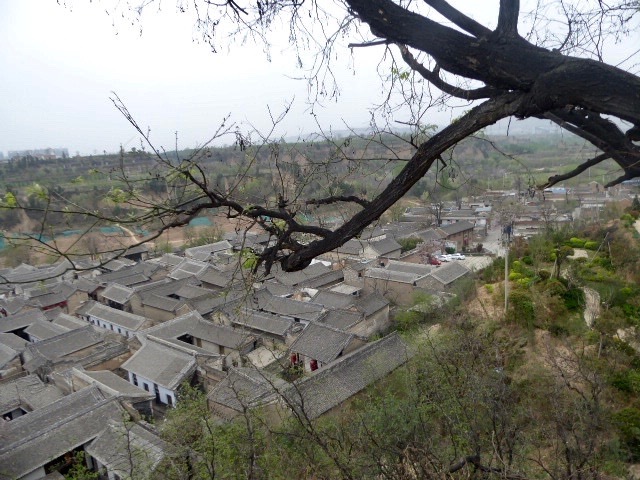 Adjacent to it in the valley below is Langdai Village, a time capsule of old China inhabited by two clans since the Ming and Qing Dynasties. 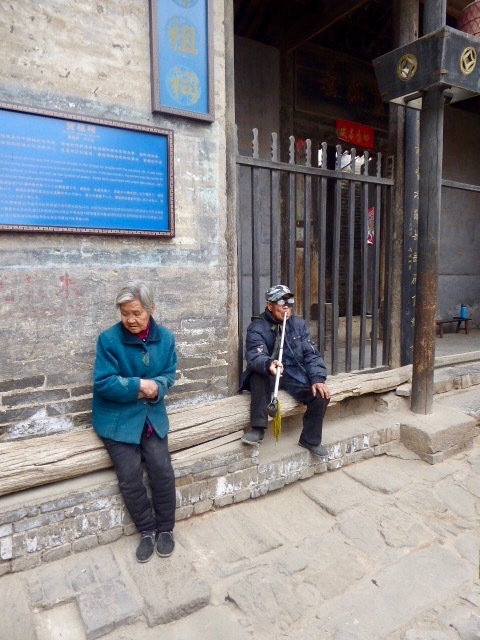 Wandering its narrow streets and buildings is to slip into an ancient way of life. 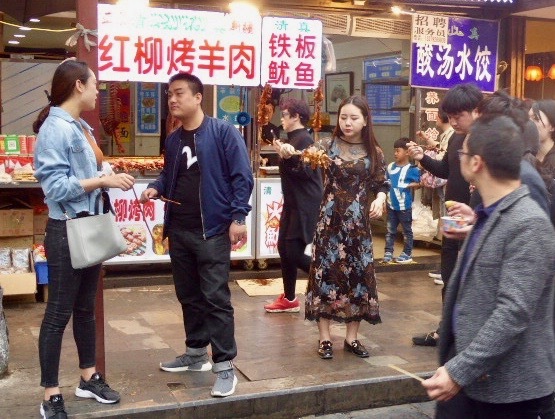 Try the clear noodles in chili sauce, a town specialty. Xi'an has many excellent hotels but I found the staffs at the Wyndham Grand Xi'an Hotel, where I stayed, and the Gran Melia outstanding. Disclosure: We paid our way to and from China but once there, we were hosted and our itinerary was set by the Shaanxi Provincial Tourism Department.